I have over $10k in cash just in case I ever need it, but I’m planning to only ever use any for a future home down payment. 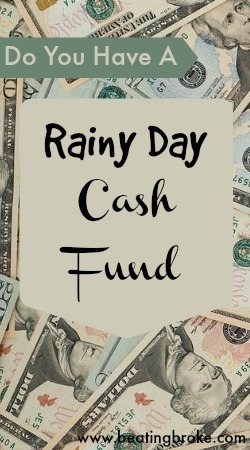 But I guess that is why it is a rainy day fund, if I had plans for the cash, it would just be savings. We’ve got a couple hundred bucks stashed in the house but nothing outrageous. I never thought to do this. My husband and I have money set aside if something happens but not cash. I will talk to him about this. Thanks! I have a couple of thousand dollars locked in my gun safe. Not the best option, since thieves look there, but generally ok.
Before, I hid my money inside my cabinet and forget about it, I was just so silly for doing that. One day I was just shocked when I saw some money in my pants and my husband’s t-shirt. I don’t have actual cash hanging around. It’s a good idea, but I just haven’t really thought much about it. That would probably come in handy in case the ATMs and credit card machines went down…maybe I will have to keep some cash savings in the house. Hmmm. I had never thought about needing cash physically on hand in the sort of situation you describe. I had a neighbor who seemed to have cash stuffed away all over their house and it seemed crazy to me. Maybe crazy in a genius kind of way?? We used to keep $100 for the reasons you’ve mentions, but we haven’t replenished after using it a while back. It’s a great reminder that we need to get back to doing this! We started doing this years ago because we do randomly go on trips and have expenses that we pay in cash like our biweekly housekeeper and lawn guy. So we keep around $1000 in cash…it fluctuates between $500-$3000 as rent money comes in and we pay the cash expenses, BUT $1000-ish is where we try to keep it. It did come in handy when hurricane Ike took out our power for 9 days. We were able to buy groceries and gas and even covered a little gas for a cashless neighbor until the power came back. How much will i have in 10 yr? It really depends on where you’re putting your money. If you’re just stuffing it under the mattress, you’ll have $296x12x10 = $35520. Obviously, that’s probably not where you’re putting it. At 50, you should be putting that money into something like a ROTH IRA or another tax sheltered retirement account if you have one available to you through work.